An insulating liner is most definitely a requirement for any type of custom made grilling station or island made of wood or other combustible material. 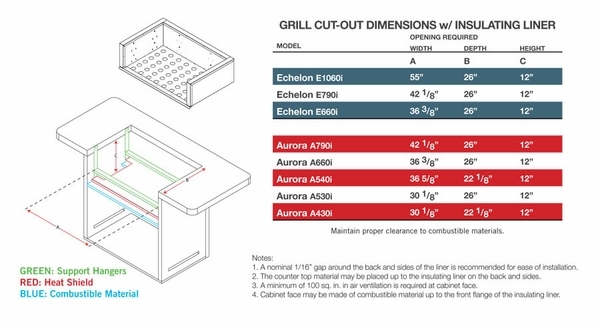 For the Aurora and Echelon series grills, it is especially easy to install and is made of tough stainless steel. Safety is paramount when constructing an outdoor kitchen and keeping the heat contained in this stainless steel insulated liner will give you peace of mind when preparing such culinary delights for family and friends.